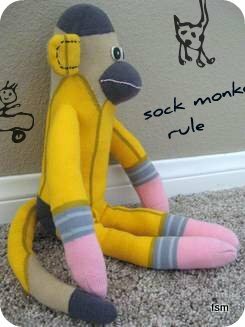 Sock monkey socks can be any socks you chose. 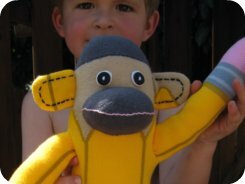 Making sock monkey toys is just one of many fun sock craft ideas available for your socks. 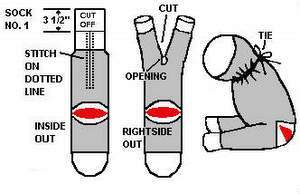 Assemble your sock monkey as per the basic sock monkey pattern and directions. 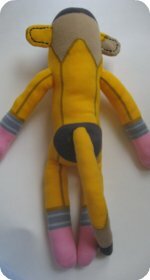 Eyes: Cut two circular pieces of white felt and place under black buttons when stitching to the head with white thread. Ears: Cut out the four ear pieces you need. Position the patterns to the way you'd like and sew in a rectangular shape leaving the opening very large. Stuff lightly. 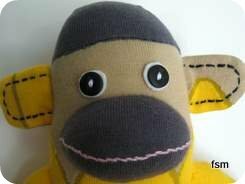 Embroider with black thread and then stitch to the sock monkeys head. Stitch on a mouth with the pink embroidery thread. 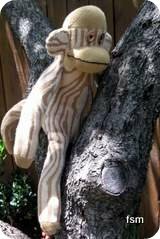 Mr Pencil sock monkey with his buddy the notebook sock monkey. TIP: Pairing monkeys with the same theme is great fun. The pencil socks are fun and there is also a notebook looking sock available. They make a nice little pair. 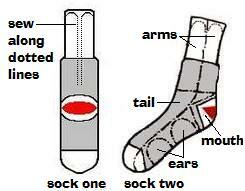 Ashi Dashi make these socks, they also create other fun, crazy socks and they are very high quality.